Treats help your pup quickly get over the fact that he's wearing shoes. 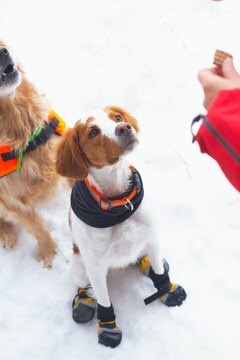 Doggy shoes protect your pooch's paws from the effects of frightful weather, sharp objects and chemicals. Despite the benefits, your pup knows booties feel awkward and make him look like a canine outcast. Choosing the right pair and using positive reinforcement will help him adjust to his new foot coverings. Outfitting your pup in shoes that are a bit too snug or leave too much room can end any hopes of your pal wearing them without protest. You'll need to find his paw length and width. Put a piece of paper on a hard surface, and place one of your pup's front paws on the paper. Make sure that paw is in front of his other, so it bears most of his weight. Use a pencil to mark the position of his heel, and then place another mark at the end of his longest nail, indicating the paw's length. Make a mark on both sides of the paw at its widest point, indicating the paw's width. Measure the respective points to find your dog's paw length and width. These measurements coincide with doggy shoe sizes. Always round up to the next size if your pal's paw measurements are in between sizes. Some companies do not factor in the length measurement. Fitting your pup's paws into his new shoes is akin to placing your feet in shoes. Start with one shoe, pull down the zipper or loosen the straps, widen the inside with your fingers so there's plenty of room and slip the boot onto his little foot. You should feel your pup's toes in the front of the shoe. If you can't, pull the shoe up more. If your pal has dew claws, press them gently inward to tuck them into the boots. Dress him in one shoe at a time, tighten it -- with straps, zippers or both, whichever is applicable -- give him a tasty treat for being a good boy and then move onto the next one. The shoes should be tight enough that the top does not move or rub against your pup's leg when you pull or twist them. If the top moves at all, it can rub against his dew claw or his skin, leading to sores and blisters. Getting your pup used to wearing his shoes calls for a healthy dose of positive reinforcement. Giving him a treat after you put on and tighten each shoe is the first step. After he has on all of his boots, forgo taking him outside right away. Bring out his toy basket and play with him for a few minutes. Let him adjust to the funky feel of his new accessories while having fun doing so. You want him to understand that his shoes equal fun, and there's no better way to do that than immediately immerse him in playful activities. After about 10 minutes or so, get him ready for an enjoyable walk. Some dogs are not fond of shoes, even if you positively reinforce their new experience. Some may buck like a wild bronco, while others fall to the floor and act like they can no longer walk. If your pup reacts in this way, take it slow and reward him for each successful step. For instance, suppose he goes crazy when you place two shoes on his front paws. Wait for him to calm down and remove the shoes. Start again, this time letting him sniff and feel the shoes. Give him a treat for reacting positively. Place his paw inside the shoe, give him a treat and then take it off. Slowly expose him more and more to the shoe until he has one on; move onto the next shoe. Although over-tightening a proper fitting shoe is unlikely, it is possible. If you notice symptoms of an over-tightened shoe, such as swollen and irritated feet and legs, remove the shoe. If the swelling and irritation doesn't go away as the day goes on, call your vet.